Dr. Montessori’s insight into children came about through her close scientific observations and evaluations of children’s development. It became apparent to her that children can reach full potential in a specially prepared environment. This basic concept is a fundamental key of the Montessori method. 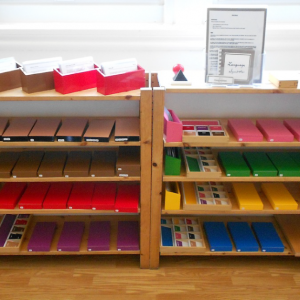 The Montessori materials are a crucial part of the prepared environment. These developmental materials provide the children with many learning opportunities. The materials educate the children’s senses. Each material contains a means of self-correction. In this way, the children are led towards independence. 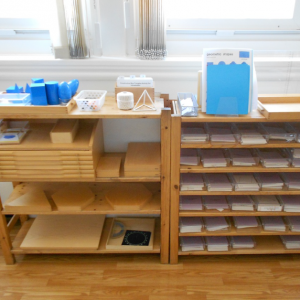 The Montessori teacher is an important element in the prepared environment. The training of the teacher includes an emphasis on observation of children. Through this practice, the trainee teacher understands that the mind of the child operates differently from the mind of the adult. Dr. Montessori observed that children experience predictable periods of development. Each period offers specific opportunities for personal, intellectual and social growth. Sensitive Periods, also known as times of optimal learning, allow the children to learn with ease during the developmental periods. The first period from birth to six years is known as the period of the Absorbent Mind. The children absorb all impressions from the environment through their senses. The second period from six to twelve years differs dramatically from the first. The influence of the Absorbent Mind is replaced by the Reasoning Mind. The children become more socially and morally aware, as their intellect develops through the influence of their creative imagination. The third stage from twelve to eighteen years continues all the previous developments. For more information about Montessori Education, please visit our Research page for a list of dynamic links to video’s and article’s on Montessori. Call the Montessori Teachers College Office today to learn more about our Course Offerings throughout the school year (416) 640-1565.